laboratory developed test (LDT) this test was developed and its performance characteristics have been determined by Focus Diagnostics. Performance characteristics refer to the analytical performance of the test. Tthis test is performed pursuant to a license agreement with Roche molecular systems, Inc.
provides more rapid results than other methods, including culture. Preferred specimen(s): Throat or nasal/nasopharyngeal swab in 3 ml m4 media or VCM medium (green-cap) tube or equivalent (UTM). If using swabs, use only sterile dacron or rayon swabs with plastic or wire shafts. Do not use calcium alginate swabs, as they may contain substances that inhibit PCR testing. Insert swab into one nostril. 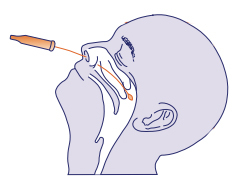 Rotate swab over surface of posterior nasopharynx. Withdraw swab from collection site; insert into transport tube. Repeating procedure for the second nostril will deliver optimal combined sample. After collection, immediately transport specimen to the laboratory for viral testing and viral antigen detection. If transport to the laboratory is delayed, place specimen on ice or in refrigeration. Indicate source of specimen on both the requisition and specimen transport device.